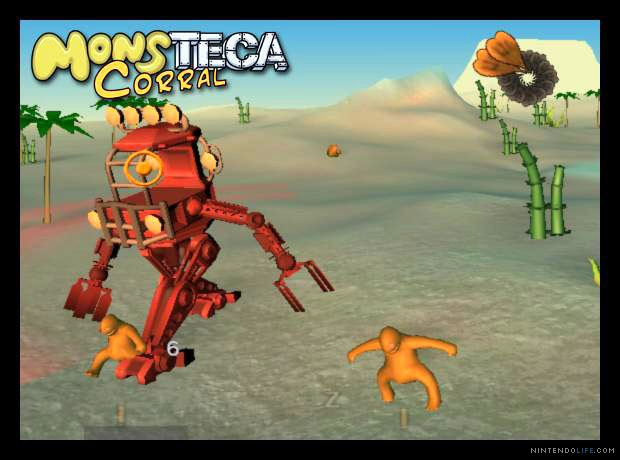 Following our recent A Monsteca Corral: Monsters vs. Robots review, we headed to Liverpool in the UK to chat with independent developer Onteca’s Jon Wetherall (Producer) and Rich Alston (Art Director), about their first WiiWare title. Nintendo Life: Where did the idea for Monsteca Corral come from and how long did it take to develop? Jon Wetherall: We originally had the idea for a Monsteca world, which was going to be a Neopets style web world, where you nurture creatures in a monster pet game. Then over time we worked with the script writer Alison Down, and Rich Alston who was the Art Director, between them they came up with a complicated storyline. This was actually for an animated television show, set around the conflict between monsters and the robots and how the robots had been made to help the monsters, but they had all gone a bit doolally. This all happened about three years ago, at that point we had been doing a lot of stop motion plasticine animations, which was the influence behind the design of the monsters, some of them were built as plasticine models first before they were 3D models. 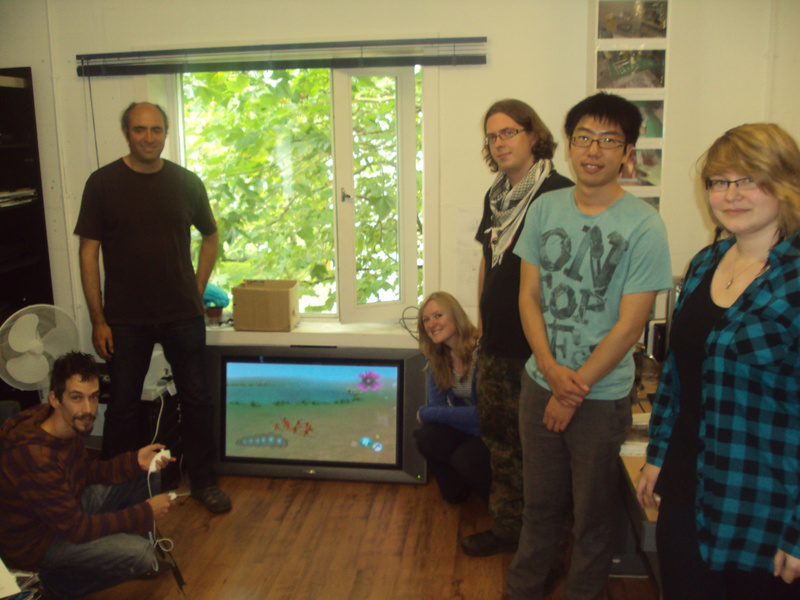 In parallel two years ago, we got the Nintendo developer status and we started with a blank slate, not to work on a game, but to work with the controller. Ben Mitchell, the lead on the project, spent about six months playing with ideas and getting the characters running around a landscape. Strangely, the Stompies were the first characters he was given. Rich was asked to knock a quick animation out in ten minutes for a walk cycle and everyone loved it so much, that it stayed as Stompy’s walk. Even when we tried to improve it, it was hard because he has no knees, which is the important part of any walk. That is why he has this slightly strange walk. So originally, for about six months we had these guys running over maps, initially they were bigger than the biggest buildings, eventually we had them scaled against the buildings. Rich Alston: In reality the Stompy size is the equivalent of a human, therefore a size guide would be of a cross between a cow and a bear. Jon Wetherall: We ended up with a tech demo of the monsters running on a landscape, but as time has gone on the interactions have become simpler. 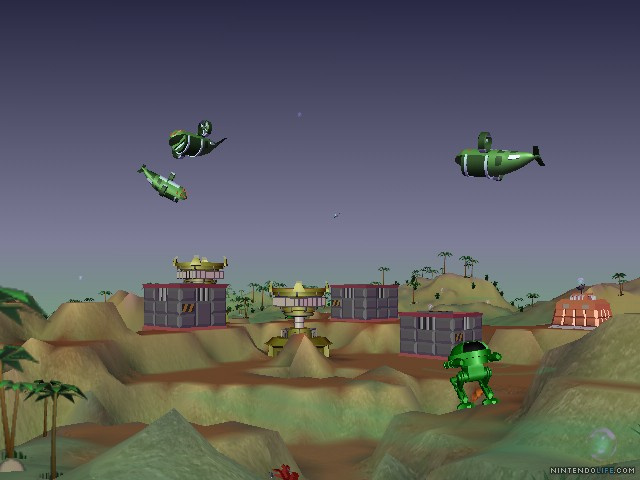 Initially we had lots of interactions, you could make them fly, with all sorts of different gameplay elements. From that tech demo about eighteen months ago, the main development happened over a twelve month period up until Christmas 2009. Then we went into gameplay tweaks for three months until March. We ended up having to make about twenty different tutorials, to explain the aspects of the game. It was a year of full development, but it has had a three year life, and it took six months from a finished game to get it onto the ‘Wii Shop’. 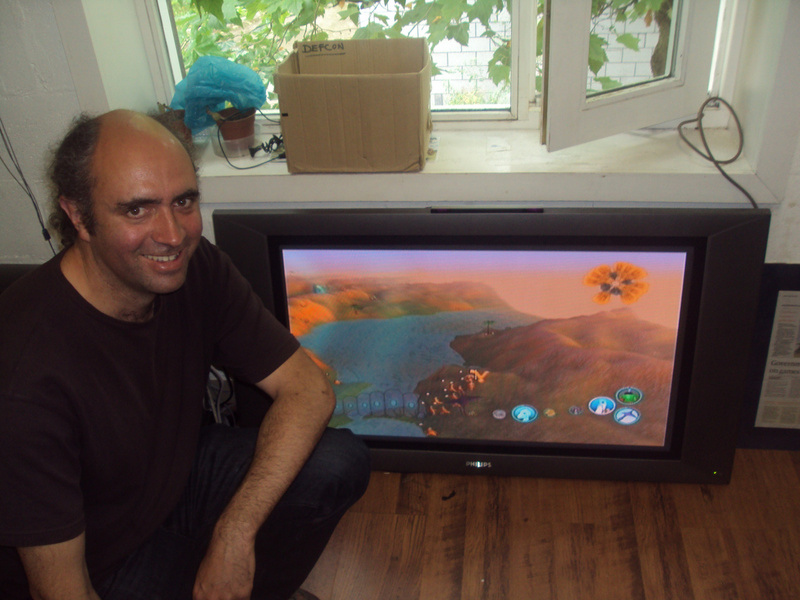 Nintendo Life: On Nintendo Life’s forum one of your game developers highlighted that Onteca set guiding principles for Corral, including a solid 60fps frame rate, avoiding loading times, and low block usage (123 blocks). What were the challenges of developing for WiiWare whilst following these parameters, as well as aiming for the 500 point price range? Jon Wetherall: It was very important to Ben that the game ran at 60fps, because he is a real gameplay obsessive, he wanted that smooth retro arcade experience. Unless you run at 60fps, you are not an arcade game. It is actually an Action/ Strategy game, because we don’t compromise on the responsiveness of it. Then there are big compromises to make, because you have half the graphics of a 30fps game, you can’t have as many whizzy effects or as many things on-screen. In each of the levels there is an element of payoff, the Lifterbot is a very high poly model which takes a lot of energy to draw, if you see Lifterbot you are less likely to see 32 Stompies, it will be designed as a 16 Stompy level. With the block usage we wanted to get into the 16meg limit, it is a business choice and also for the consumer, because it takes less space on the machine. The game is designed around low block usage and that led to another choice, which is that there are no textures in the game. All of the characters are a strong solid colour with lighting, which gives it that sense of style. We didn’t necessarily aim for a 500 point price, but we decided that because it is our first game and a new idea, we wanted people to play it. By going at 500 points, it is the price of a Big Mac meal. Nintendo Life: Monsteca Corral has been compared to Nintendo games, both Doshin the Giant and Pikmin. Were Onteca directly inspired by these titles and which other games influenced its development? Jon Wetherall: We had never seen Doshin the Giant, so when people started comparing it, we bought it on ebay. The comparisons are coincidence, but obviously they look similar. Pikmin was a really important game for me and Ben, it is definitely one of our favourite games. We looked at Little King’s Story, there are things in common between the way you control the characters. Noby Noby Boy (PSN) is our license to be weird, whatever we do will never be as weird as Noby Noby Boy. Lemmings for me is a very important game, I worked at Psygnosis and it is a great game, so it is something which we continually keep in mind. Rich Alston: We were working on a web based version, which would have been like Neopets, or a game which follows that model. For a lot of the graphic styling we looked at web games and also titles like Pokémon, because one of the original concepts would have been a baseball card style game, with points where each monster would have a different skill. 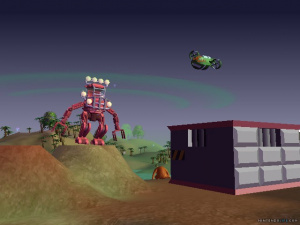 One of Jon’s original ideas was to have a fighting arena which would have face-offs between robots and monsters, with robots altering monsters with extra implants to make them level up. There were a lot of complicated ideas which were thrown around, so it was a question of what we should do for a simple idea that would introduce it, and we would lead on with the extra ideas later. Nintendo Life: Onteca has created a detailed world around Monsteca including a ‘Monsters vs. Robots’ back story, habitats and environments, as well as an ecosystem in which its inhabitants struggle to coexist. Will forthcoming Onteca games also be set in this universe? Jon Wetherall: Yes, this is the first of many Monsteca games, we feel quite akin to the struggle of the monsters, or even the struggle of the robots, they are not intrinsically bad, they are misunderstood. What form those games will take? We haven’t decided yet. We have some other ideas and we tend to revisit ideas. We have another game world concept, which we will probably take further. 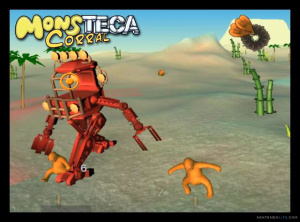 Nintendo Life: Monsteca Corral is your biggest game yet and Onteca has noted that the unique nature of the Wii Remote made Wii an attractive system to develop for. As motion control becomes available on other systems, will WiiWare continue to be your lead development platform, or do you feel that its controls are no longer differentiated from PSN and Xbox Live? Jon Wetherall: Yes, the Wii control system is a challenge, it would be interesting to do something with MotionPlus, although I don’t think you could lead with MotionPlus for a download game. We like Nintendo and we like working with Nintendo hardware, we don’t have a massive desire to work on anyone else’s hardware, although we do work on iPhone apps. Nintendo will continue to be our lead platform. We like the iPad, so at some point we may do something on iPad in particular. The Move controller for PS3 is interesting, but we don’t yet know how successful it will be. We may do a Move version, but it won’t be a lead, we lead on Wii, as it is a nice platform. Wii gamers are the right demographic for our games. Nintendo Life: Onteca have developed games for iPhone, including the puzzle game 3B Bumper Bot’s Box, which also focuses on a Monsteca robot. 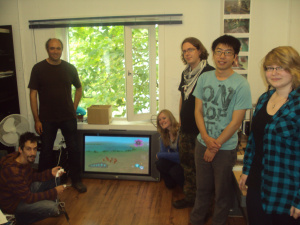 Are you interested in developing games for DSiWare? Jon Wetherall: Yes, however none of us have programmed for DSi, we know lots of other indie developer who have made DS games, but we haven’t made any. We are very aware that traditional DS product has been killed by piracy and I presume it is the same for DSiWare. We are a little bit wary, if we knew the sales figures then we could work out the costs and benefits for the company. As a platform DS is interesting, but we are late to the DS party, so we may wait for 3DS, which is what we are really excited about. Nintendo Life: It is clear that Onteca have an affinity towards strategy and puzzle games, however once a player starts to attempt Corral’s ‘Swift’ and ‘Rampant’ par time achievements there is the urgency that you would find in an action game. Would Onteca ever develop a straight-out action title? Jon Wetherall: I don’t think we would do a straight-out action game. I was talking to Ben about this and the possibility of having mini games, or even a standalone game, to help people with jumping. We took a lot of control mechanics out of Corral, for every one that is in there, we have taken out about three. There were interesting things where the Manderray would fly down and pick up the monsters with its tongue, which was surreal as it licks you up. That didn’t make the final game, although we wrote all of the code. There are a lot of mechanics that could be explored as mini games, but we are not an action game company, we are a strategy game company. Nintendo Life: Now the game has been released and reviewed, is there anything you would change in it from hindsight? Jon Wetherall: Yes, the one thing I wish we had done is put a tutorial in for the level select tree, a few people are getting stuck on that and I feel bad for them. We are putting a tutorial on the website, but it is too late to put it in the game. 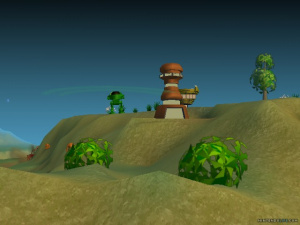 Flower (PSN) is a big influence on the level select tree, although the game does not look like Flower. Rich Alston: There is another game called Zen Bound on the iPhone, that has something similar to the level select tree. Jon Wetherall: I love it and I don’t want to change the interface, it is one of the nicest things in the game, and it took an immense amount of time to create. For those of you stuck on 56%, which is a number that comes up repeatedly, I would have made that one achievement lighter. You need 58% to continue, the game opens out more, there are bigger levels and once you get through the 56% point, you are on your way to finishing the game. However, no-one so far has reported finishing the game and there is a nice ending, but I won’t blow it. It is not really a bug with the camera, we played with that camera a lot, but occasionally it does go back too far, although there is always a way around it. Apart from that we are really pleased with the game. Nintendo Life: The six separate achievements for each level combine to make Monsteca Corral a challenging WiiWare title. Onteca have been helping Nintendo Life readers with gameplay hints on our forum, is there one last tip you would like to share with them? Jon Wetherall: The Imposter Bot is the challenge of Corral really. 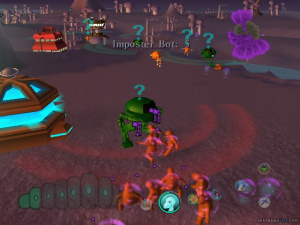 For those of you who have not yet met the Imposter Bot, he looks like a Stompy, he is really annoying and he runs in the middle of your herd and blows them to smithereens. He doesn’t kill anyone, but he sends you back to zero and he gets rid of all of your bubbles. He is just horrible! You have to develop your own tactics for the Imposter Bot, he is very hard to fight head on. I advise you to not get him with your whole gang, split your gang up and take five of them to knock him over. For any robot, you need to get them in the water to deactivate them, but they will get rescued by the Helibot. If you knock out the Helibot base he will fly away, so robots can not be rescued. A quick detail about Imposter Bots is that they don’t follow you around hills very well. 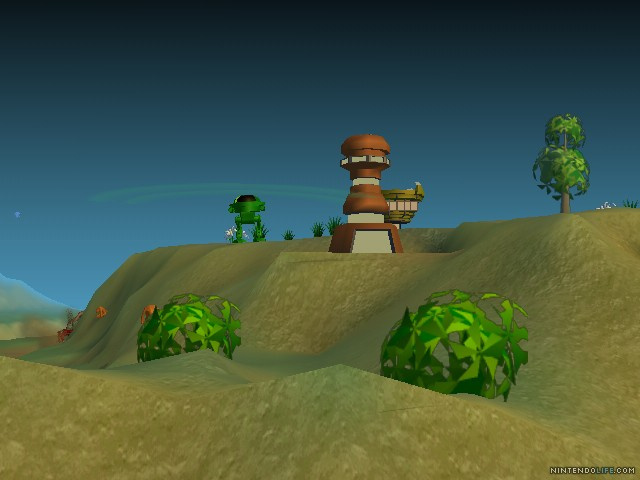 On the Summit, it is a really lovely level, you can stay on the hill and he won’t get you. Nintendo Life: Are you planning a direct sequel to Monsteca Corral? Jon Wetherall: Yes, that is an exclusive for Nintendo Life! There are two potential sequels, we have not decided which way to go. One is a sequel in terms of game design, so it is not set in the same world. The other is a sequel set in the world, but it will take a couple more months to develop, because we have a few other projects to finish. Perhaps a prequel is next, we are not sure. It is quite slow to get a slot on WiiWare, so it won’t appear in a hurry. Nintendo Life would like to thank Jon, Rich and all of the team at Onteca, for their time and for welcoming us into their development studio. Mr. Retro, Jamie's encyclopedic gaming knowledge is so far beyond measure we'd love to open a library inside his head. Hurry up, science. 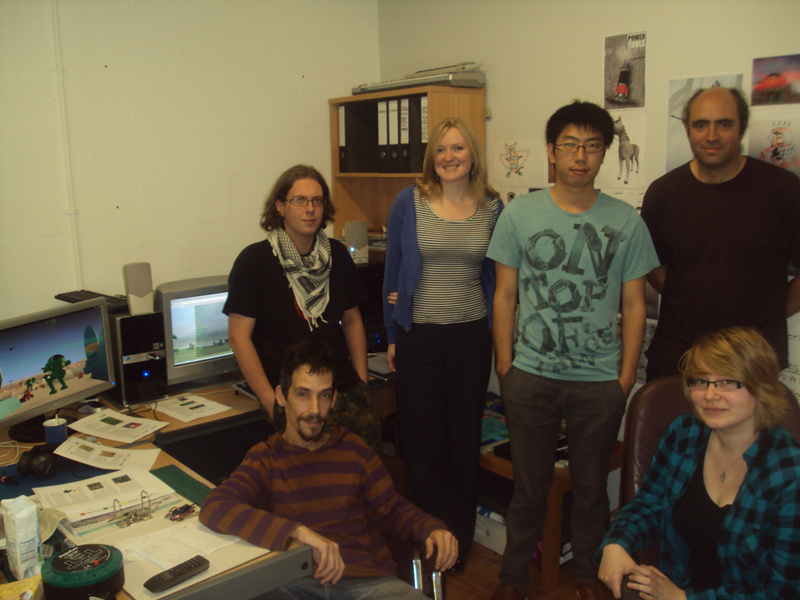 Onteca team I just want to say a good job on a very well made game. Hope to see more from you guys in the future, which it sounds like their will be. Did you ask the Onteca team why the Stompies walk like they've wet themselves? Good interview, and a sequel? If they fix the problems the first game had, I'm up for it. Well done to the interviewer for making 'em spill the beans. By the way, in the review you said that the game looked ugly, but judjing by the screenshots it looks alright. What's wrong with it? Maybe it's just that I have bad taste. Great interview, I'm definitely looking forward to the sequel. I think its great that they ran out and bought Doshin the Giant off eBay after hearing comparisons. I've never played the game, but caught some videos of it, and the two games do look a lot alike. The giant even looks like a big yellow Stompy! Good interview. Good to see these guys learning from experience. This game was riddled with problems that ruined a pretty good experience. I look forward to see them improve on this base. Great interview Jaime. It was very well done and had lots of good information. After completing the game, I am itching to get my hands on the next game in the Monsteca series. I'm really excited about that upcoming sequel! It is good to see that they are commited to sticking with Nintendo when it comes to releasing their games. I was actually curious if they had considered the idea of making a Monsteca Corral game on the PS3 now that Move is scheduled to be released. Nice to see you address that question in the interview. I also think that a Monsteca Corral game would be an great idea for the 3DS. I really hope to see that happen someday. I do have a question about the ending of the game in Monsteca Corral. The interview suggests that there is a nice ending when you finish it but the ending I got was a screen shot of some of the characters with the message: "Congratulation on completing the game. Thanks for playing." I did get 100% completion on the game but I didn't unlock all of the achievements. Is there a better ending to the game once all of the achievements are collected? Just to say thanks to Jaime for coming over to the office, he enthusiasm for 'classic' gaming is inspiring and it was great fun in fact I think he stayed all afternoon. We played some two player together but got a bit scared of the CPU. @WolfRamHeart, the ending I referred to in the Interview is the 'battle' with the CPU so you have unlocked the whole game. The attract mode will now show you some other parts of the Monsteca world but they are just to look at. 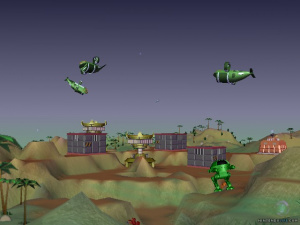 We did create 3 extra worlds which were going to be unlocked on completion but they were moved down into the main game. Hence the 23 levels on the game tree rather than the 20 advertised. @LuWiiGi I agree we don't think the game is ugly, the game has a certain style much of which is dictated by doing an 'open world' 3d game for Wiiware. There just isn't room for lots of textures. Most (all?) of the other Wiiware games are either 2d, 3d on rails or 2.5d platformers. We decided to make a game where your ability to roam was pretty complete. Plus we are religious about running at 60 fps which gives us half as much drawing power to play with. We followed Nintendo's lead and used strong single color characters and buildings. There are loads of nice particle and other graphics in the game and it all comes together well. The Stompies are kind of based on Toddlers who walk as if they are wet themselves (because often they have). It is partly about making the player want to look after them and partly because it is funny. Overall thanks, and well worth the money. PS - I don't think it's ugly, it just looks like a $5 downloadable game, more Kahoots mini than Critter Crunch (and it's never gonna look like Spore or Pikmin @ 16MEG!). @stompy Thank you lots, it was great fun for me too, cheers for introducing me to Monsteca's later levels and the dastardly CPU, I had not reached that far in the game before. I experienced my first go of Corral's multiplayer as well, I played it with Jon Wetherall, although to be honest my contribution to completing those levels was not the greatest. lol. It was a great afternoon, Onteca's team are very friendly and courteously chatted to me about my obsession with retro gaming on top of discussing their game! I even saw Sinbad who used to be in Brookside, in Liverpool Lime Street train station, that afternoon. Cheers! @SuperPowerBros Cheers to you Patrick for all of your suggestions towards the interview questions, alongside your detailed Monsteca Corral review, they were a big help in my preparation for meeting Onteca. @WolfRanHeart The interview was carried out just one day before you posted on the Monsteca forum that you had completed it, so when Jon said "no-one so far has reported finishing the game", I thought it was cool that you were possibly one of the first gamers outside of the dev team to beat it. I had a feeling that you would be pleased about Jon's answer to the last question, because you were asking about a sequel on the forum too.